We hope to see your team at the tournament in 2016: June 3-5!! The Thunder Baseball Board of Directors would like to thank you for supporting Thunder Baseball League and Susan G. Komen Colorado “Bats for a Cure” Tournament. Our program is about promoting good character, developing young player’s skills in a positive manner and preparing for high school baseball and beyond. We owe our success to the wonderful support of community members like you. 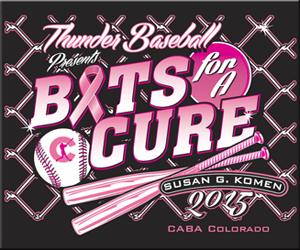 We had a record two hundred (200) baseball teams during our fourth annual Susan G. Komen Colorado – CABA Colorado “Bats for a Cure” Baseball Tournament on May 30-31, 2015. All donations and specific portions of registration fees, shirt, socks, and hat sales are dedicated to Susan G. Komen Colorado©. Members of Thunders Board of Directors and tournament volunteers are invited drop off the check in the amount of $19,538.15 on July 8 at 2pm to Susan G. Komen, located at 50 S. Steele Street, Suite 100, Denver, CO 80209. Our awesome volunteers will be treated to a lunch (12:00pm prior to dropping off the check) at Panera Bread-The Shops at Walnut Creek, 10450 Town Center Drive, Westminster. We are honored and humbled by the opportunity to help men and women of Colorado fight breast cancer. Since 2012, Thunder Baseball has raised $51,892.37 for Komen Colorado. Our mission is to help develop youth into active community members using sports as the vehicle. To support this goal, we give back to the community by supporting Broomfield High School Sports Gala, giveSPORTS, A Precious Child, and Broomfield FISH. We are providing financial support, scholarships, volunteers, and a collection location to drop off gently used sporting equipment. With your ongoing support, Thunder Baseball will continue to grow and make a difference in the lives of youth and families in our community. Thank you again for your generous contributions.